Looking for a different way to get your daily protein? Whip up these simple, four ingredient brownies! They’re perfect on the go, for your last meal before bed or even as a sweet start to your day! 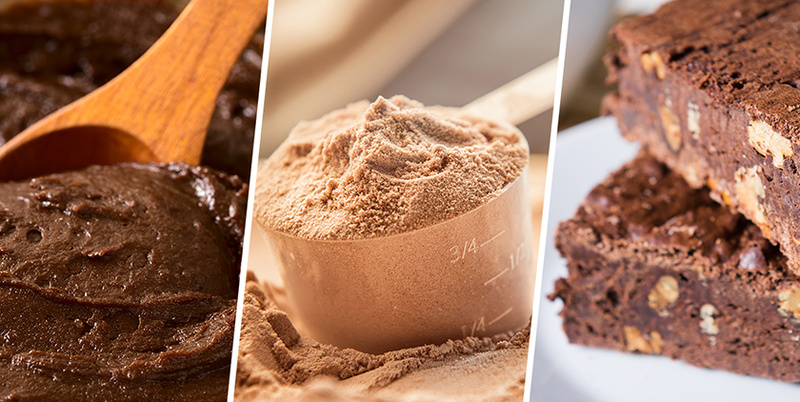 Since they contain no sugar or flour, these protein brownies are also a low-carb option. If you’re following a ketogenic diet, be sure to substitute almond or cashew butter for the peanut butter, as legumes are not allowed on keto. Preheat the oven to 350 degrees F. Line a small 8×8 baking dish with parchment paper or grease well. Set aside. In a large bowl, combine the mashed bananas and peanut butter, and whisk until fully combined. Stir in the protein powder and cocoa powder with a wooden spoon. Pour the batter into the lined/greased pan. Bake for 12-20 minutes or until cooked through. Cool for at least 10 minutes before cutting. Cover the leftovers and store in the fridge for up to three days. Enjoy cold or at room temperature. Love your results? Share your photos with us on Facebook or Instagram!